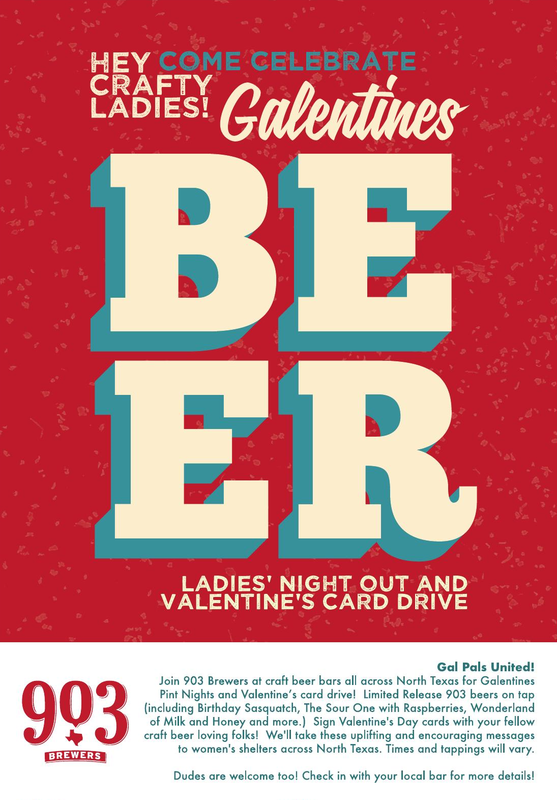 Looking to raise awareness about local women's shelters and to empower women throughout the community, 903 Brewers will host a special series of events over the next two weeks at establishments all across North Texas. 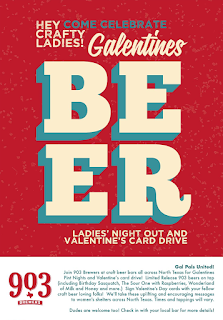 Galentine's, as it's being called, combines a run of pint nights with a Valentine's Day card signing drive. Regarding the latter, the goal is to have guests sign cards with encouraging and uplifting messages, which will then be delivered to women being served by domestic violence shelters. Of course, there will be beer too, with brews like Birthday Sasquatch, The Sour One with Raspberries and Wonderland of Milk and Honey expected to be tapped (selections vary by location). Dates and times for scheduled events are given below, and take note that while each is designed to be a ladies' night out, gentlemen are welcome to attend as well. Donations sought: Adult flip flops, reusable grocery bags, totes, umbrellas and children's Valentine's Day cards. Attractions include live music, arts and crafts and a smoked lamb dinner special. Donations sought: Toiletries, paper towels, toilet paper and coloring books for adults. Attractions include a Girl Scout cookie and beer pairing flight.